Our program offers opportunities and experiences that will enrich, expand, and develop a child’s ever-increasing accumulation of knowledge in a loving Christian atmosphere. To build a foundation of understanding that Jesus Christ is our Lord and Savior — through Chapel and a living-learning environment. To offer opportunities and activities to help each child develop a healthy self-concept, which includes accepting his/her abilities and God-given talents; thus, fulfilling each child’s individual needs (spiritual, emotional, psychological, intellectual, and physical). To foster the development of positive social skills through participation in small and large group activities. To broaden each child’s aptitude for future learning. To provide a loving environment, enabling each child to trust his/her teachers and become more secure away from home. 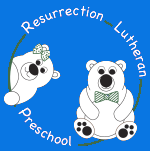 Resurrection Lutheran Preschool is a ministry of Resurrection Lutheran Church. We are currently enrolling for the 2018-19 preschool year. Please call or email for class availability and a tour.